9K White Gold AA Santa Maria Aquamarine (Rnd) Half Eternity Band Ring 1.500 Ct.
14K White Gold AA Santa Maria Aquamarine (Ovl), Diamond Ring 0.750 Ct. Despite being discovered as early as 300 B.C. the March birthstone Aquamarine became popular only in the early 17th century. Derived from Latin word Aqua Marinus, it means water of the sea and refers to its beautiful ocean-like colour which varies from deep-blue to bluish green. 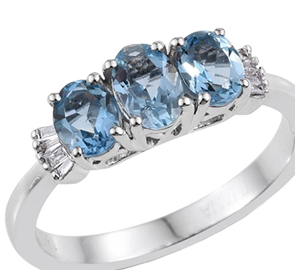 We at TJC bring an impressive assemblage of Aquamarine Rings for the gorgeous women of UK at incredible prices. We aim to offer you the best of gemstones possible from around the world with Espirito Santa, Brazilian Canary, Santamaria, and Milky Aquamarine in our array. Elegantly set in Sterling Silver with 14K Gold and Platinum overlay or Rhodium plating our collection of large aquamarine rings is quite modernist. We have enchanting pieces in the cluster, crossover, eternity, 5 stone, trilogy, floral, 3-stone, solitaire and 7-stone setting to suit individual style and preferences. Symbolising honesty, loyalty and faithfulness these rings are increasingly becoming popular as Engagement rings especially when embellished with other precious gemstones like Diamond or Topaz. If you’re a fan of luxurious contrasts, then there’s no place better to find it than here. Our ring designs made in gold bring you coveted luxury in pair with fantastic designs. Be sure to spot our marvellous solitaire aquamarine rings in gold that are sure to send you in a tizzy! Our spanning collection brings you the different colours of gold, offering a display that you won’t find anywhere else. Be it the traditional excellence of yellow gold, elite divinity of white gold, or darling femininity of rose gold, we have everything and beyond in store for you. Another promising assortment at TJC offers you sublime silver aquamarine rings. These gorgeous features flaunt impressive designs that you can exclusively find here. Not only in the eternally shining excellence of silver, but our rings also feature the plating of premium metals, like platinum, rhodium, gold, and more. In fact, our aquamarine cocktail rings have been the centre of all the gushing positive attention. These keepsakes deserve a forever spot in your treasure, so come pick! The magnetic sparkle of aquamarine looks even prettier when it is paired with the godly excellence of diamonds. These two stones have similar crystal quality and complement each other perfectly when it comes to the hues. We display a fabulous array of these rings that will make you shop a whole collection of them. Our aquamarine and diamond rings in yellow gold, specially have been the reigning bestsellers since a long time. The swoon-worthy appeal of aquamarine makes it an ideal gemstone to be placed in engagement rings. The pale blue-green crystal complements your dynamic flair and blends wonderfully with several designs. Our collection of engagement rings studded with aquamarine is something that’s unique and coveted. Here with TJC, you’ll find the designs that you can adorn forever or will get a whopping yes from your fiancé. Explore the truly stunning collection to find that perfect piece! One of the biggest reasons why you ought to pick us has to do with our elite grade. We offer you a posh collection of real aquamarine rings that display the gem in its finest grade. We mine our own gemstones and offer you just the best and nothing less. Another reason for you to come pick us has to do with our pricing. We know and understand your budget and love working within it. That’s just why our affordable aquamarine rings in UK bring you a divine and uncompromised quality, without denting your pockets.